Every semester at one of [Bruce Land]’s electronics labs at Cornell, students team up, and pitch a few ideas on what they’d like to build for the final project. Invariably, the students will pick what they think is cool. The only thing we know about [Ian], [Joval] and [Balazs] is that one of them is a synth head. How do we know this? They built a programmable, sequenced, wavetable synthesizer for their final project in ECE4760. First things first — what’s a wavetable synthesizer? It’s not adding, subtracting, and modulating sine, triangle, and square waves. That, we assume, is the domain of the analog senior lab. A wavetable synth isn’t a deep application of a weird reverse FFT — that’s FM synthesis. Wavetable synthesis is simply playing a single waveform — one arbitrary wave — at different speeds. It was popular in the 80s and 90s, so it makes for a great application of modern microcontrollers. The difficult part of the build was, of course, getting waveforms out of a microcontroller, mixing them, and modulating them. This is a lab course, so a few of the techniques learned earlier in the semester when playing with DTMF tones came in very useful. 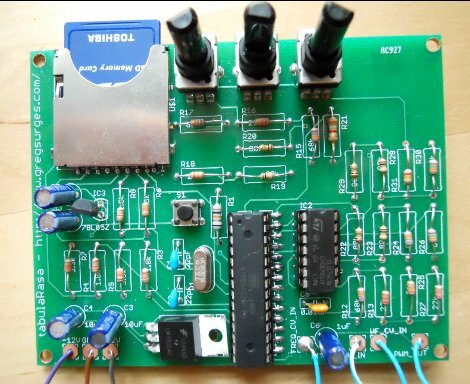 The microcontroller used in the project is a PIC32, and does all the arithmetic in 32-bit fixed point. Even though the final audio output is at 12-bit resolution, the difference between doing the math at 16-bit and 32-bit was obvious. A synthesizer isn’t useful unless it has a user interface of some kind, and for this the guys turned to a small TFT display, a few pots, and a couple of buttons. This is a complete GUI to set all the parameters, waveforms, tempo, and notes played by the sequencer. From the video of the project (below), this thing sounds pretty good for a machine that generates bleeps and bloops. The tabulaRasa is a digital wave table oscillator, and features control of frequency, wave table selection, and interpolation. The device is split up into 2 parts. One is a pcb with a healthy amount of resistors, 3 potentiometers, ST TL074 JFET op amp, atmega328 and a SD socket. The second part is software for your computer that allows you to edit or create your own waveforms. There are 3 different modes of control. Breakpoints, which allows you to set the waveform points and allows up to sixteen. Harmonic allows amplitude control over 16 harmonically-related sine waves, finally, the third mode lets you load in short sound clips. Once you’re happy, save to a SD card and pop it into the board, and you’re ready to make some noise. The project page states at the end “tabulaRasa is in the last stages of development, and will be available soon.” so you cant get your hands on one just yet, but if you’re interested [Greg] has a kickstarter page setup where you can find out details on pricing. Electronic musical instruments are a lot of fun for a hacker because, with a small palette of tools, know-how and curiosity, they are easily modified. As with any hack, there is always the chance that the subject will be ruined, so it’s not necessarily worth the risk to muck about inside your thousand-dollar pro synthesizer. Luckily for all of us, there are shovel-fulls of old electronic musical toys littering the curbs and second-hand shops of the world. These fun little devices provide ample opportunity to get familiar with audio electronics and circuit bending techniques. A note on definitions: the term “circuit bending” can be synonymous with “hardware hacking” in the world of audio electronics, and we have seen some debate as to which term is better suited to a given project. We welcome you to share your viewpoints in the comments.